A little over a week ago, my family lost another incredible person. Uncle Raymond was my grandmother’s eldest brother and the last surviving child of Dudley Moses Mitchell and Opal Blanche Strickler. He was 94 years old when he passed. I remember a couple of visits with Uncle Raymond and Aunt Juanita as a child. The most prominent is when we stayed with them on a trip across county when I was 7 years old. I got my first milkshake at a true Malt shop and visited my first grain elevator with Raymond and Juanita. I feel so incredibly lucky to have grown closer with this side of my family in the last five years. On two different trips to Kansas in the last several years I got to visit with Uncle Raymond and get to know him. I can’t help but smile when I think of the drive around Topeka where he pointed out houses, told stories, and paid respects to family gravestones. He was so generous with sharing all he could remember. There was a lot of laughter and love that day. 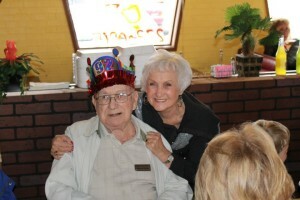 Raymond Mitchell and Roberta Mitchell Fleming at Raymond’s 92nd birthday. Raymond A. Mitchell, 94, of Topeka, passed away on Friday, May 29, 2015 at Aldersgate Village in Topeka. He was born February 20, 1921 in Topeka, KS, the son of Dudley M. and Opal B. Strickler Mitchell. Raymond attended Hutchinson High School. He was an Army Veteran of WWII. He resided in Topeka since 1991. Raymond was employed as a manager for the Farmland Cooperatives for 30 years prior to retiring in 1985. In 1983, he was appointed by Governor John Carlin to the Kansas State Grain Advisory Commission. He was a member of Grace United Methodist Church and the Gideons International. 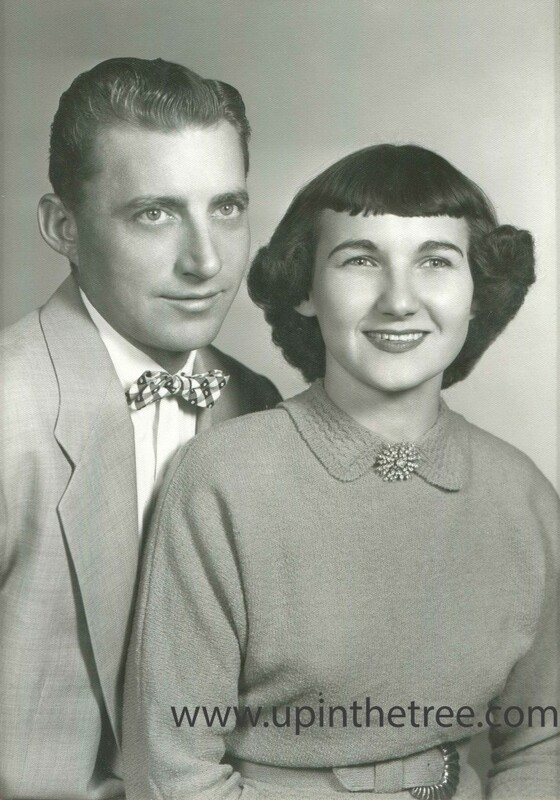 Raymond married Juanita Burleson on May 3, 1942 in Hutchinson. She preceded him in death on November 15, 2001. He was also preceded in death by two brothers and two sisters. 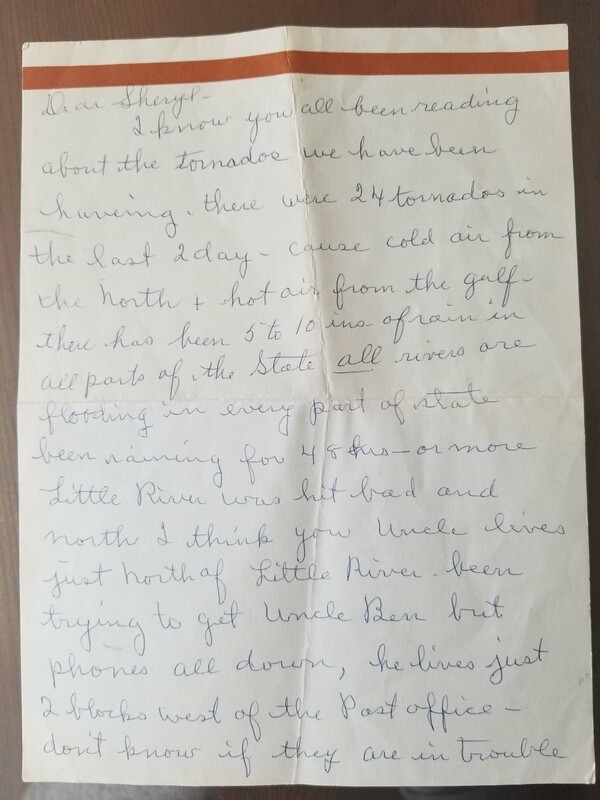 Survivors include three children, Judith Dene (Melvin) Farris of Paola,KS, Jalayn Rae (John) Love of Berryton, KS, Rev. Victor A. (Ellen) Mitchell of Highland, IL, six grandchildren, twelve great-grandchildren. Services will be held at 11:00 a.m. Wednesday, June 3, 2015 at Grace United Methodist Church. Burial will follow in Penwell-Gabel Cemetery. Raymond will lie in state and the family will receive friends from 6:00 – 7:30 p.m. Tuesday, June 2, 2015 at Penwell-Gabel Mid Town Chapel. In lieu of flowers, memorial contributions may be given to Gideons International, P.O. Box 140800, Nashville, TN 37214-0800. This is a photo that was in my grandmother’s possession. I made digital copies of many of her photos over the years as I would visit. It was always a fun time to hear her stories as we looked at the photos together. She always did her best to identify who was in each picture. Sometimes we were able to identify some or most of the people but not all. This picture is a good example of that. This photo was taken about the early 1940’s. I do know that Laura Mitchell passed away in 1947. My estimation for the photo comes from the age of my grandmother in the photo. The people in this photo are a mix of families. Dudley, Laura, and Tava (Nancy Octavia) were all siblings in the Mitchell family. 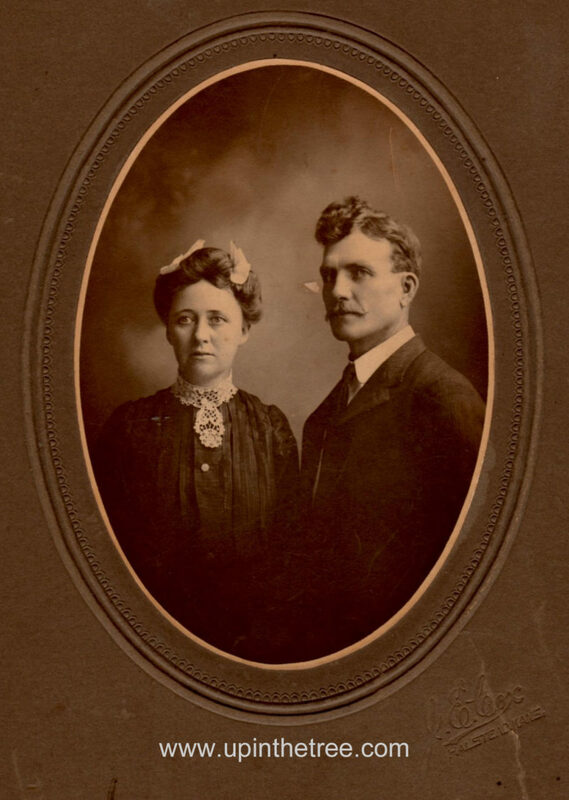 Tava was married to George Gragg so the Unknown Gragg in the photo could be George Gragg or one of her sons. Wendell Elliott is the son of Lawrence Elliott. Lawrence Elliott was married to Opal Strickler’s sister, Ruby. My best guess is that she took the photo. 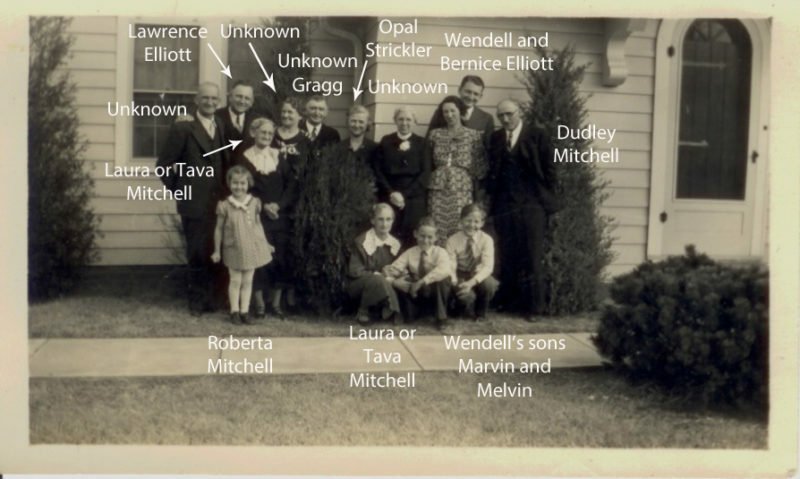 These families were very interconnected because Lawrence Elliott was Dudley’s nephew and brother-in-law (read more about that here). 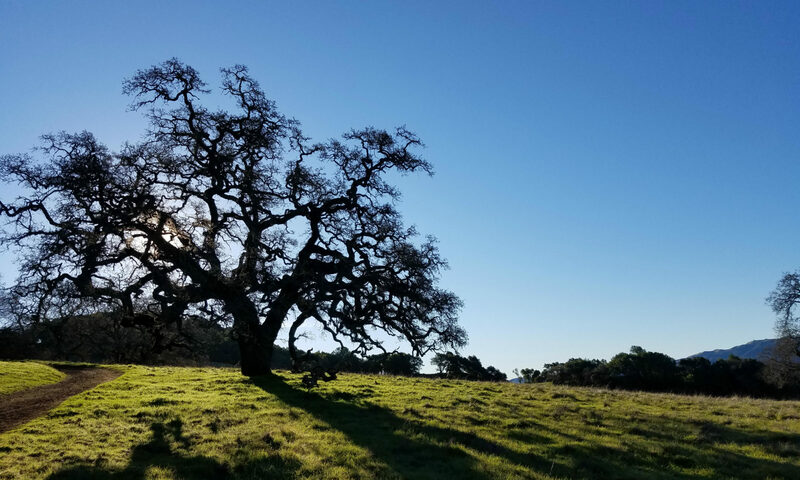 If you would like a copy of this photograph, I am happy to share a clean copy without names. ***Family – if you recognize any of the unknowns in this photo, it would be greatly appreciated if you would pass on their names!! 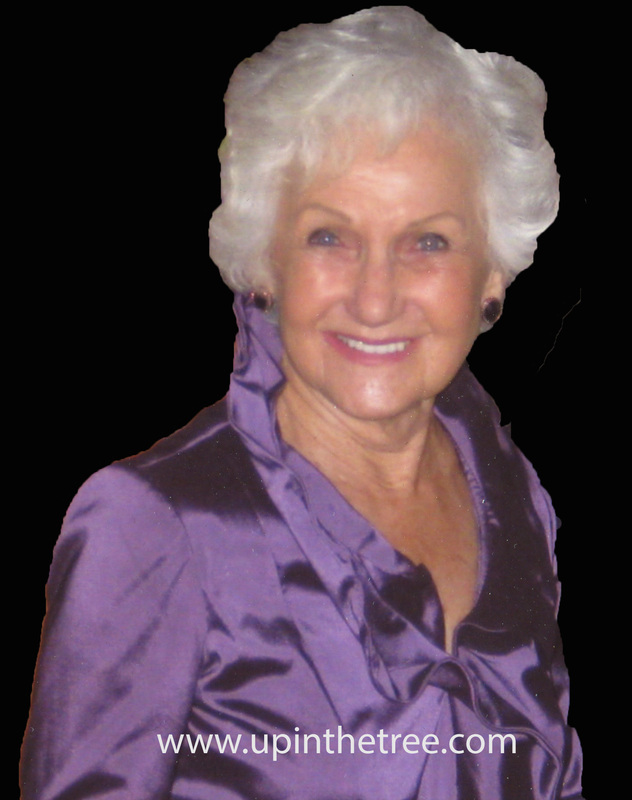 This past Wednesday, January 31, 2014, my grandmother, Roberta Fleming passed away peacefully with her family around her. She was known by many names including Mom, Grandma, Aunt Roberta, Birdie, and the Silver Fox. A couple of years ago when my children, her great-grandchildren, were born we added another name, Gigi. It was her short hand for Great Grandmother. She wanted a fun grandma name. My grandmother was born Roberta Irene Mitchell to Dudley Moses Mitchell and Opal Blanche Strickler on January 10, 1931 in Topeka, Kansas. She was the youngest of five children with one older sister, Loretta, and three older brothers, Raymond, Delbert, and Kenneth. Her family moved to Hutchinson, Kansas during the Depression. Grandma stayed there until she attended X-Ray Technician school in Topeka, Kansas. While at school, she met my grandfather, William Henry Lawbaugh. They married in 1950. The couple starting raising their family in Pratt, Kansas with their first three children. They relocated to the Anaheim, California area in the late 1950’s. There they added to the family a set of twins. In 1964, Bill Lawbaugh passed away leaving his wife with 5 children. Roberta went to work to provide for her family. In 1973, Roberta married James Fleming. They joined their families Brady Bunch style, five from her side in addition to the four children Jim had. They lived in several cities in Los Angeles and Orange counties. I have many memories from my childhood of them being together. In fact, I learned how to swim in their pool when they lived in Downey, California. After their time in Downey, they moved to the desert, living in the Cochella Valley. 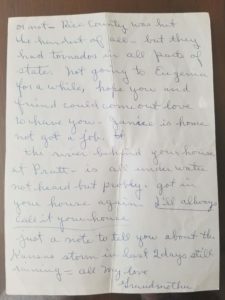 After Jim Fleming passed away in 1994, Grandma moved back to the beach. She loved the ocean and was at home in San Clemente, California. This was during my college years in San Diego. At least once a month I would make the 45 minute drive north to spend the weekend with her. We had so much fun together! All of the facts above do not capture the entire picture. My grandma was fun and feisty. She LOVED her children. It would not be a complete day without a Crown Royal and cigarette, even her dog enjoyed cocktail hour with a piece of ice. Her house was never quiet, either the news channel was on the TV or she was playing her beloved big band music. She loved to dance. Our family has the great memory of dancing the night away at my cousin’s wedding this past summer. While she was not interested in researching her family herself, she was always willing to tell me stories of her childhood and what she remembered of others in her family. Grandma was a horrendous driver. We were always offering to chauffeur her places. She was an avid Bridge player. The drawer of her coffee table has many sets of playing cards and bridge score sheets. Grandma was very neat and clean. You were always careful to make your bed and clean up after yourself at her home. Most of all Grandma loved being with her family. Holidays were always big affairs with lots of food and football. Most Sundays were spent with family on the beach. The beach was a slice of heaven for my grandma. I could go on and on. She is going to be so greatly missed. I have to take comfort in how she taught us all to be a family. I know that although she is no longer at the head of the family, we have each other. In a few weeks I am flying to the East Coast to meet my new nephew. I am so excited to finally meet the little man in person! He arrived a few weeks early so I have been obsessing over him through the photos my sister has been sending. While I love the little man, I plan on disappearing one day of our trip to get some genealogy research done. This year I am jumping in with the big boys and girls. I am going to spend my day researching at the National Archives. I spent a couple of hours last weekend getting ready for my trip. First item on my list was to learn more about visiting the National Archives and Records Administration (NARA). At the NARA website one of the first tabs you see invites you to learn more about planning a visit to one of their locations. I clicked on the District of Columbia location and found address, hours, transportation, food information, etc. I also visited the webpage for Researchers. This was important because it outlined the procedures, types of records, and orientation information. 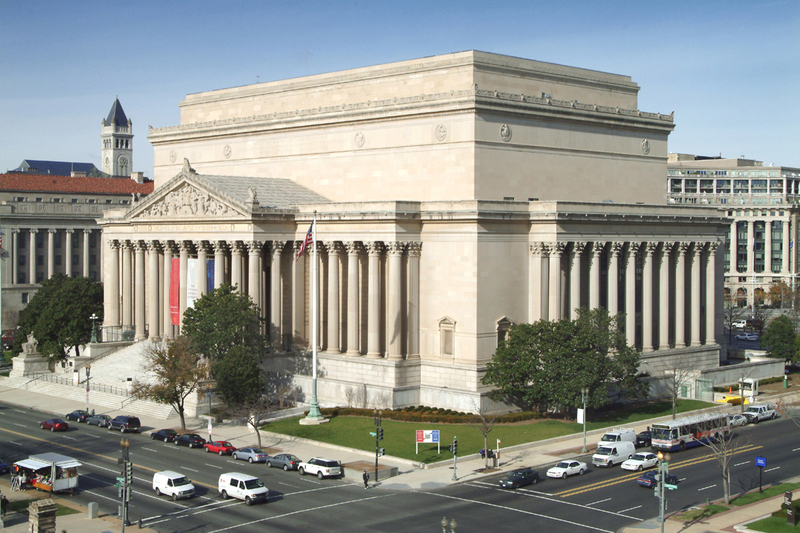 Also included on the page was a video explaining what to expect when you research at the National Archives. Now that I know how to behave myself, I turned my genealogy powers to what exactly I wanted to learn more about. I am currently transcribing a series of deed records for my ancestor Moses Mitchell. He bought land from one of his brothers in Jackson County, Kansas in November 1858. This trip will be a great time to research how the family obtained the land in Kansas. As I complete my research to do my research I am remembering the day Joshua Taylor spoke at the Spring Seminar at the San Mateo Genealogical Society. I distinctly remember when he said you generally need to put in an hour of work ahead of time for each hour you plan to spend at a research facility. I am getting my hours in so that my trip will hopefully be successful. Wish me luck! Mary Eugenia Bradley is my great great grandmother. She was born 18 December 1867 in LaSalle County, Illinois. 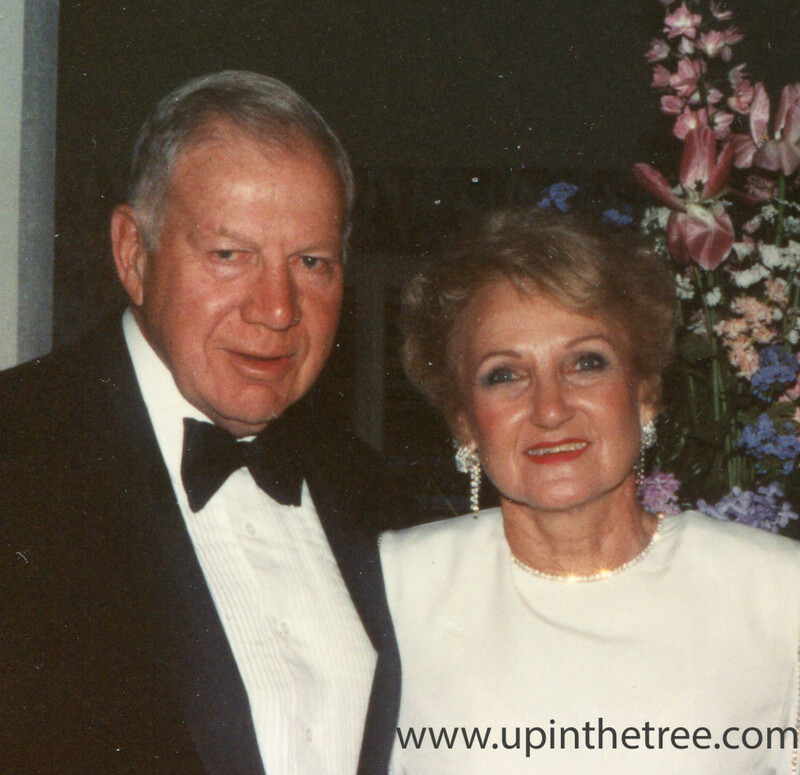 Frank Switzer was Mary’s second husband. They married in 1906, four years after Mary was widowed with four surviving children (two children from her first marriage died young). 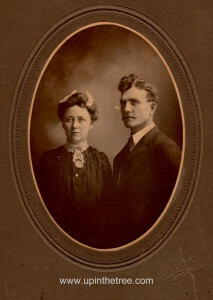 Mary and Frank would have a son, Milford, in 1909. Mary would be widowed again in 1934. Frank passed away in Halstead, Kansas. 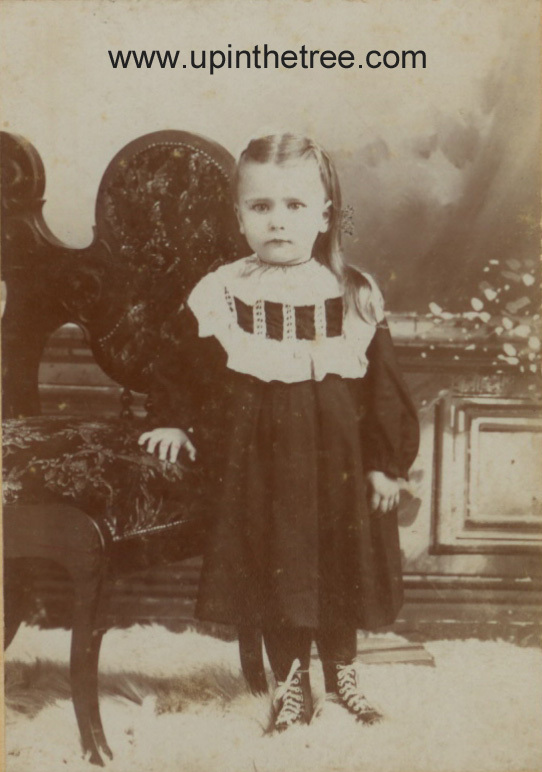 Mary would live another sixteen years before passing away at her daughter’s house in Wellington, Kansas. Frank and Mary are buried together in the Halstead Cemetery, Halstead, Kansas. Emerald Felicia Suzanne Doretta Abigal Strickler is the youngest child of Abraham Strickler and Effie Flock. She was born April 1st, 1902 in Haddam, Washington, Kansas. This photo was taken about 1904-1905. 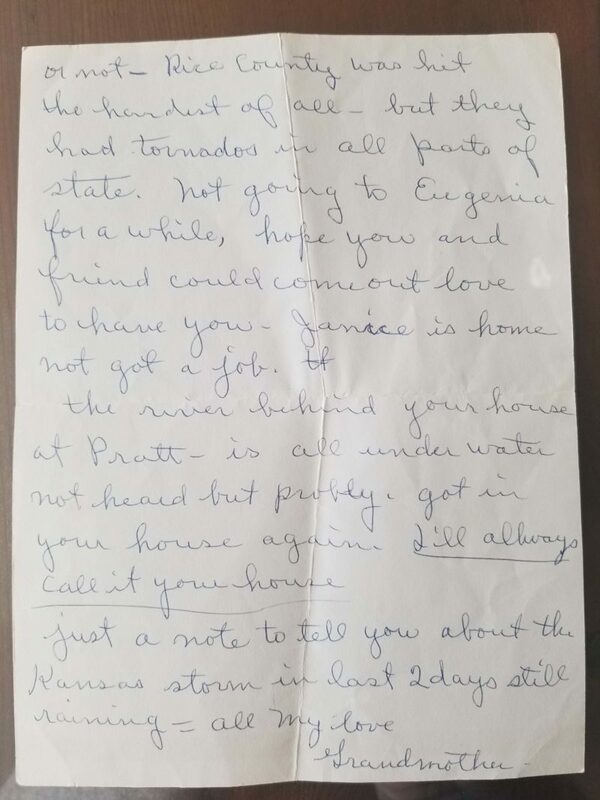 The family was still living in Washington County, Kansas at the time of this photo. This is another photo from my great-aunt Susie’s collection. She was so generous to share photos and stories with me when I visited Kansas last fall. She has given me permission to share the family photos on my blog. 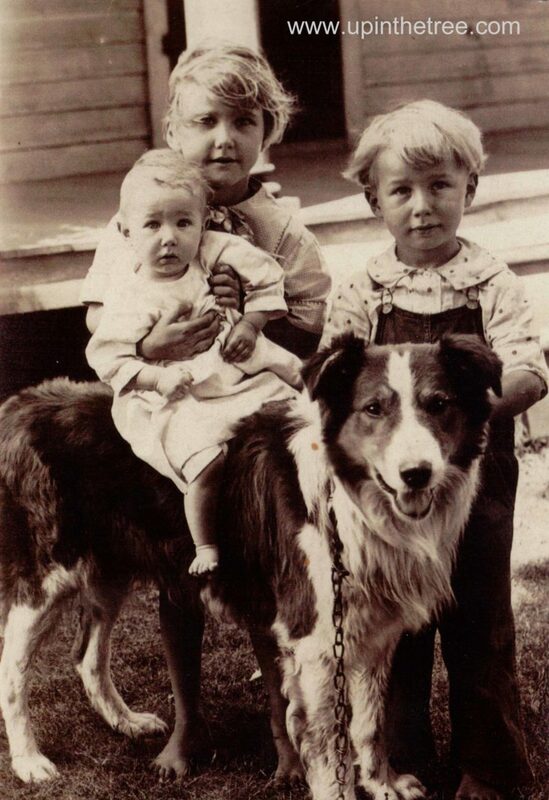 This photo is the only picture I have seen of my grandmother’s siblings as young children. 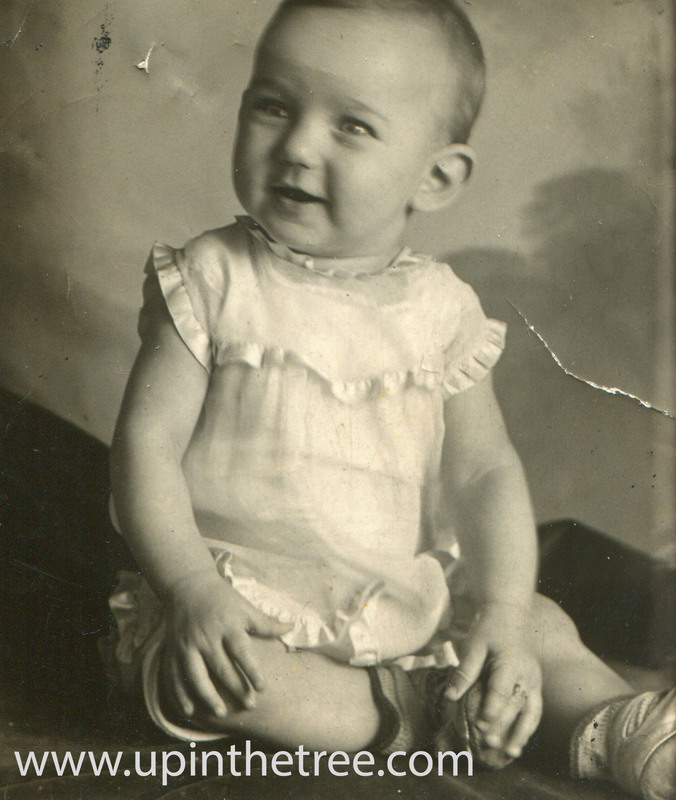 Delbert, the baby in the photo, was born in December 1924. I am estimating that the photo was taken in 1925. That means Loretta, holding Delbert, would have been 7. Raymond, to the right, would have been 4. I wish I knew more about the dog. He is obviously good with the kids and they must have loved him very much! 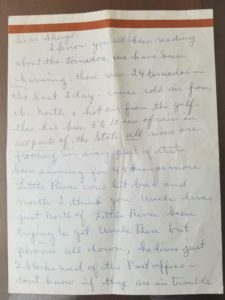 I am sharing photos from my grand-aunt Susie’s collection. I scanned photos from her family album in September 2013 in Kansas. She has agree to let me share them on my blog along with the information we know about the people in the photos. It was so much fun to share family stories with her. I apologize for the slight distortion in the photo. I must have accidentally moved my Flip-Pal as it scanned the photo. I got very excited about this photo when I saw it. I immediately knew the name from the obituary of my great-great-grandfather, Abraham Strickler. Unfortunately, all of the information I know about the Rodger’s Hotel is what I found in that obituary. I have been unable to find any further information about the hotel. I believe this may be one of the last photos of Abraham Strickler before he died in March 1910. 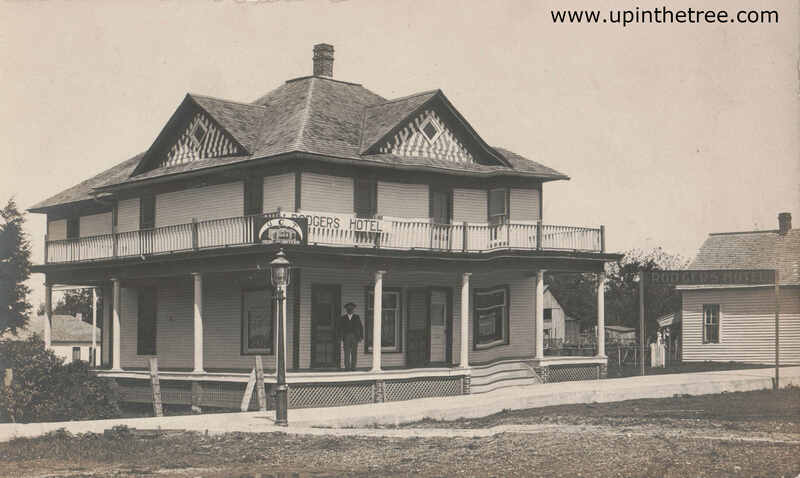 His obituary states that be bought the hotel when he moved to Fall River, Kansas in 1908. He was only there about 18 months before suffering a stroke. He died only four months later. There are so many things I love about this photo including the street light, sign above the street, the columns on the building, the large porch, and the colored tiles on the roof. I know the family was very invested in this town. Not only did Abraham buy the hotel but he also purchased the Fall River Creamery. We know his wife Effie ran a millinery shop in town. She had run an advertisement the day of her husband’s funeral apologizing for the delay in any orders for Easter. She went on to say that her and her daughters would work to be sure all orders were finished before Easter that weekend. It makes me sad to think what hope for the future the family had when they moved from Northern Kansas to Fall River. It would all change so quickly. 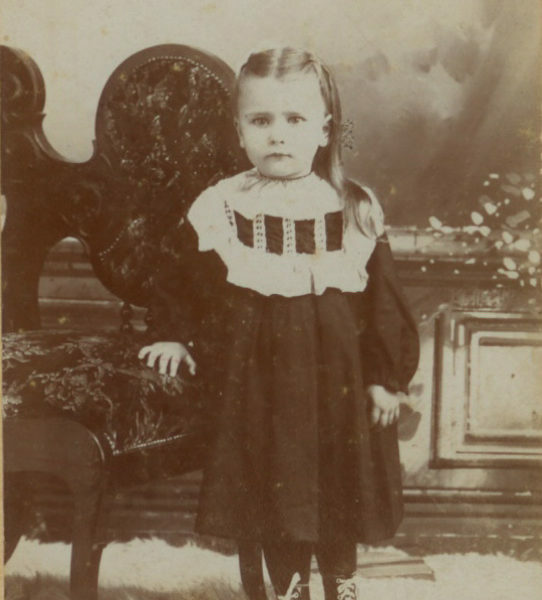 Effie Strickler and her three daughters would move to Topeka, Kansas between 1911-1914.